Let’s hear it for the #XYZsquad! For the second year in a row, the purple people were a major hit with South By Southwest (aka SXSW) attendees. From Graffiti Park to Downtown Austin, the #XYZsquad parkoured across the city during one of the largest conferences that attracts 72,000+ attendees each year from all over the world. Back-flipping, forward-flipping, photo-taking, and sticker-giving, they covered a lot of ground while explosively (and awesomely) spreading the message that .xyz is for every website, everywhere. Were you at SXSW? If you were lucky and caught a glimpse of the #XYZsquad, tell us about it! Tweet us @XYZ, tag us on Instagram, or drop us a line on Facebook. Until next time, #GenXYZ! The holidays are upon us, #GenXYZ! November has been an amazing month for us, starting with the great partnership with Gandi and the Electronic Frontier Foundation (get the deets here), all the way to our first ever hackathon with Product Forge in Scotland (details coming soon). 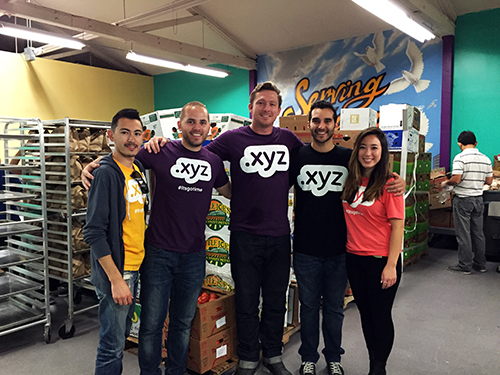 Ever wonder what Team XYZ is doing behind the world’s most popular new domain extension? 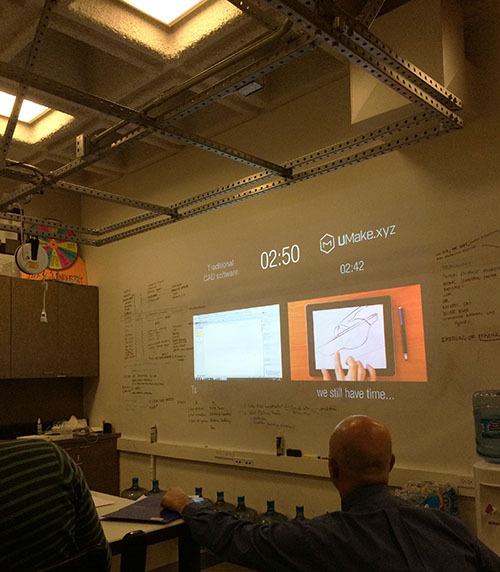 We’re excited to share with you the most recent photos and the official premiere of our office Movember videos! 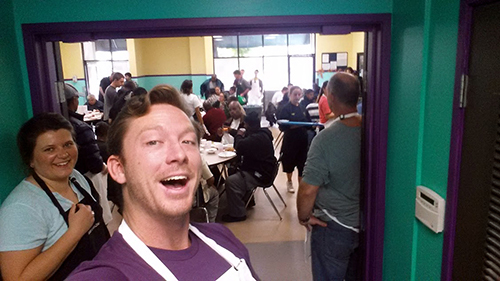 In an effort to give back to our own local community, over the weekend, Team XYZ began a volunteer partnership with the St. Francis Center in downtown Los Angeles. 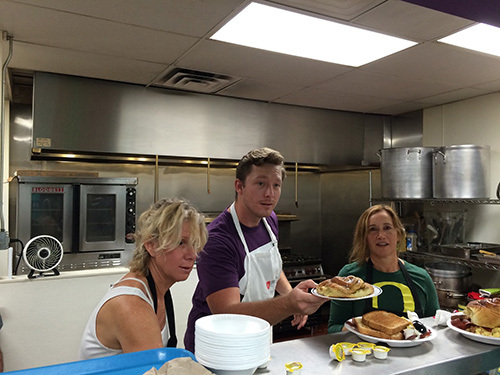 The St. Francis Center is an amazing organization that is responsible for feeding and providing resources to the homeless and elderly, and we couldn’t be more excited to prep, cook, and serve food to our neighbors in need. What did you think of the video? Let us know through the usual Twitter, Facebook, or Instagram – our ears are always open for you, #GenXYZ! And last but certainly not least, from our XYZ family to yours, we hope you have a very Happy Thanksgiving! 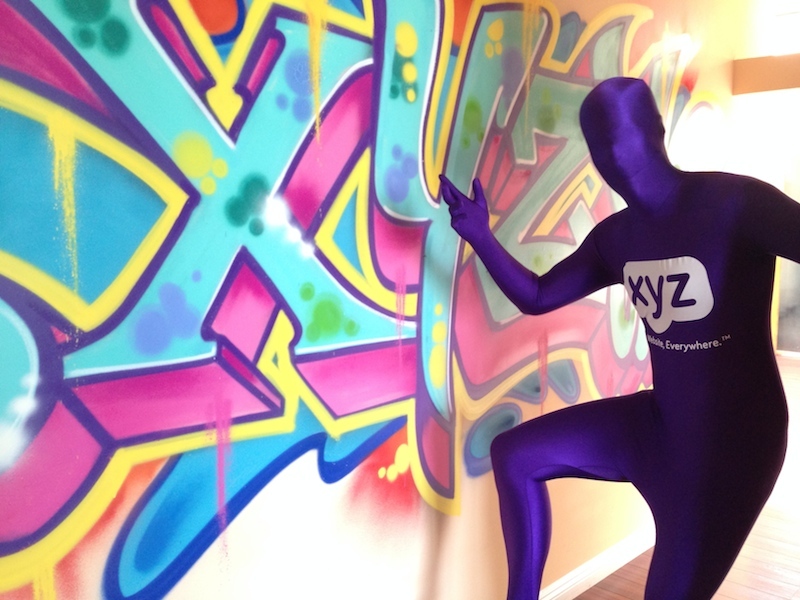 If you caught any of our recent tweets, you already saw glimpses of our bold purple man, officially known as a member of the #XYZsquad. For all you lucky people at SXSW (or the always envied Austin locals), keep your eyes peeled and cameras on for the elusive #XYZsquad this Sunday. If you catch them in the wild, take a photo and share it with us @XYZ on Twitter or Instagram with the hashtag #XYZsquad for a chance to win great prizes. Not at SXSW? Not a problem. Retweet an #XYZsquad photo for your chance to win (and increasing the chance for the original tweeter to win — double winning). Keeping Austin weird with the #XYZsquad — let’s do this! You’ve probably heard that the US women’s bobsled duo picked up a well-deserved silver medal in Sochi, but did you know who won the gold at the #XYZolympics? Let’s recap. After we announced our official sponsorship of the New Zealand bobsled team, we wagered a friendly (yet possibly deadly) #XYZolympics bobsled bet against Name.com. 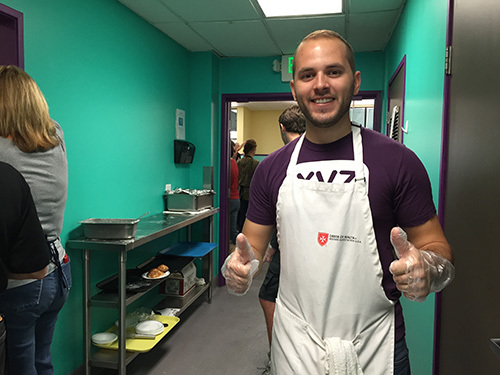 They were represented by their Community Evangelist, Jared Ewy, while the big man himself, Daniel Negari, put his life on the line to compete on behalf of .xyz. Both parties quickly jumped into physical training, wardrobe selection, and some good ol’ fashion social media trash talking. As promised, the camera crew followed the newly-minted bobsled athletes to Whistler, closely documenting the lead-up to the big race. A pre-race sneakpeak shows the two as they learned all the “worst case scenarios,” tips to avoid your underwear melting to your body (hint: roll, don’t slide), and the exciting reveal of the awesome bobsled with .xyz freshly painted across the nose. As if catapulting down an icy course at 85 mph in a metal vessel wasn’t enough, Daniel and Jared added a little something more to increase the pressure — after all, they’re here to represent their brands. If Jared wins, Daniel must “enthusiastically, to the point of harassment, talk about Name.com and how great it is,” all while wearing a bobsled helmet. Upon Daniel’s triumph (naturally, as the domain extension for every website, everywhere), Jared must don the full-body .xyz. That meant, Jared must cover himself head-to-toe in .xyz stickers, for one whole day: the full-body .xyz. So who won the race? Check out this epic video as the two zip down the most dangerous bobsledding track in the world. And the best part? Catch all the drama, alleged scandal, and cashing in on the bet, as we conclude this season’s #XYZolympics. 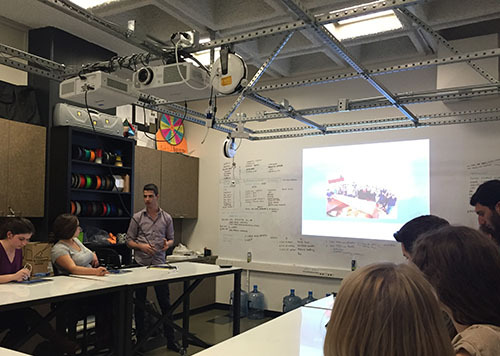 Read up on the full story in our press release, which was picked up by WND. 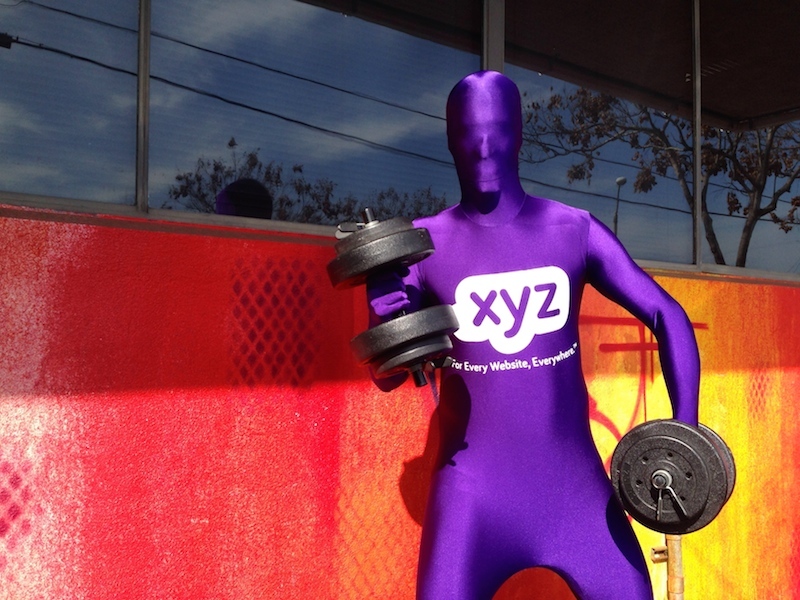 With our launch just right around the corner, we have more exciting promotions up our sleeves (or should I say, up our purple suits…) As always, our eyes and ears are peeled for you guys, #GenXYZ, so connect with us and stay in the know by following @xyz and our Facebook and Instagram!